The miraculous ITC contacts received by our INIT organization between 1995 and 2000 provide the basis for most of the information on this website. Most of this world-changing information was received by just one of our INIT receiving stations (Luxembourg) in the span of five years, so imagine what would happen if ITC receiving stations were set up all around the globe, sending information to our world, continually, from the other side. Science would enter a new age of enlightenment. Religion would enjoy a renaissance. Everyone would have a richer sense of our true nature. We would no longer view death as a dark, scary finality but a glorious sunrise… a welcome return to eternal life. Humanity would resonate to a finer vibration. That would have been the best-case scenario for INIT. Our connections would have branched out into a network of research organizations and ITC receiving stations in various parts of the world, and wisdom and knowledge would stream to our world from the finer realms of spirit. The spread of ITC would have required harmonious attitudes among researchers. It would have involved collective enthusiasm, mutual support, trusting collaboration, free sharing of information… and we humans don’t seem ready for that. How many resonant networks like that do you know? Seriously. Today’s online social networks let people share personal interests, ideas, pictures, and friendship… but the same networks also spread bullying, intimidation, vicious gossip, and compromising photos that can ruin people’s lives. In short, our networks reflect the noble-savage nature of their human members. 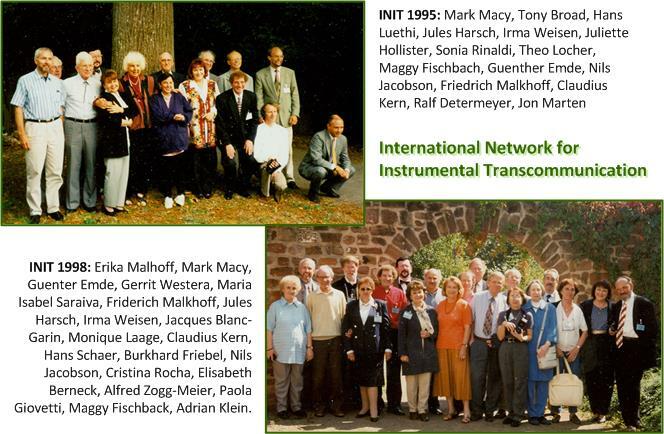 INIT was nothing more than a network of human beings with a lofty calling. It was the noble nature of our members that bound us together to experience some of the greatest miracles of the second epoch. Especially during the first two years (1995-96) we were filled with awe and inspiration by the other-worldly messages and images we were receiving from our spirit friends. We felt love and friendship toward each other. It seemed that we were on the threshold of one of the greatest events in human history. Then, starting in 1997, it was our savage qualities that began to break us down and slowly tear us apart. One member developed doubts about the legitimacy of certain contacts, which I and other members knew to be legitimate. Another member insisted relentlessly that we needed scientific approval of our research, which I and other members knew to be improbable, given the incompatibilities of scientific and spiritual principles. (Read more about that incompatibility). These petty assaults among members were rare, and each one seemed at the time like a tempest in a teapot… the normal residue of human weakness that was quickly cleaned up later, through correspondence, and forgotten. But it’s these basic human weaknesses, our savage qualities, which tend to chip away at any group and to make it a monumental challenge for us humans to sustain the resonance needed to aspire toward finer spiritual pursuits. Every time the discord unsettled our group, our spirit friends told us they had to go to great lengths on their side to protect and sustain the contact field, which began to lose its clarity and sharpness. Our spirit friends began to lose touch with us as our emotions darkened. On these occasions they said it was always important for us humans to lay our cards on the table… to be sincere and forthright with each other. Harboring ill will gave the contact field a cloudy texture that made ITC increasingly difficult… and when that happened, more troubled spirits were attracted to the chaos and would begin to influence our members. So, one might wonder why our INIT group didn’t just remove those members who were the most disruptive. For one thing, we all saw mostly the noble qualities in each other. It’s not easy to turn away a friend. Also, one member or another was at the core of our group, such an integral part that without that member’s presence we all felt that the ITC contacts would end… which left us in a “catch-22” position. My wife Regina has been mystical as long as I’ve known her, attending spiritual retreats and getting involved in meditation groups, Course in Miracles study groups, the Infinite Way (Joel Goldsmith), and other fine spiritual programs. She observed my experiences with INIT with mixed feelings. On one hand she saw all the world-changing information we were receiving from the other side and knew its importance and spiritual integrity. On the other hand she observed the petty moments of in-fighting and their gut-ripping effect on me… and she wondered why such information of high spiritual content was coming to our group. Why not, say, to a group of devout priests or dedicated spiritual seekers who worked on sustaining harmony in the ranks? Regina also wondered why I simply didn’t leave INIT, considering how I was affected by the troubled interactions. That was an easier question to answer: Any stresses and strains from human failings were a tiny price to pay for the world-changing potential of ITC. I believed that then, and I believe it today. Don’t abandon a spiritual path because your noble-savage nature is in the way. Adjust your nature so it’s no longer in the way… and continue on the path. That’s what I’ve been trying to do since the coming-apart of INIT around the year 2000… which I hope to write about in the next article. This entry was posted in About Mark Macy, After we die, Heaven and Earth, ITC, Other-worldly matters, Spiritual realms and tagged contact field, INIT, ITC, resonance, spiritual pursuit. Bookmark the permalink. Mark – makes sense. Finding like-minded people who “get it” led by someone with the communication skills to inspire the group away from those potential interpersonal land-mines I’m sure isn’t easy (but not impossible). There’s some great people (some who even have special abilities) out there – check out a guy “Steve Huff” (he’s got a YouTube site “Steve Huff Paranormal”) – he definitely appears to be the real deal (he’s almost certainly a “medium” that’s also spiritual and humble). His ability to attract class A (intelligent) EVPs is pretty amazing. A good read on all of these dynamics is Mark’s book, “Miracles in the Storm” which I recommend to all. Thanks for showing me this post it helped to clarify a few questions I had but, I have more haha. The people in the group that doubted the legitimacy of the contacts what were they doubting? Were they doubting that it was coming from a pure healthy spirit source? Or did they think someone was playing games and it wasn’t from a spiritual source as all? Have you found new people to help you try to reconnect to the other side? Do you even know if the spirit side is even interested in communicating with us anymore? It would be really cool to know if they have new information for us on earth.